HENRI MATISSE Autograph signature on book limitation page. 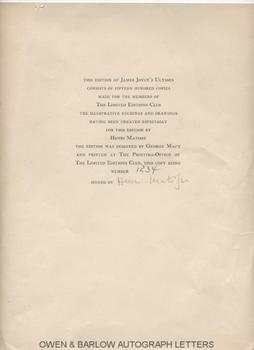 Autograph Signature "Henri Matisse" on the limitation leaf from an edition of 'Ulysses' by James Joyce. Fo. 30 x 23 cms (11.75 x 9 inches). A little light edge creasing, else fine. The book from which this colophon leaf was extracted was published by the New York Limited Editions Club in 1935. It was the first illustrated edition of James Joyce's 'Ulysses' and the first and only edition was of 1,500 copies. Matisse provided 6 original lithographs and 20 plates of further illustrations. This was copy no 1,234 and bears a good, clear ink signature of Henri Matisse below the limitation statement. Quite what happened to the rest of the book we don't know!